Got a minute? Good. Let's see how you can start to improve the dynamics in your marriage right now. It's like this: There are sixty seconds in your day that are absolutely pivotal in terms of how you and your spouse will relate to each other for the entire day and night. Ready? Got a minute? Good. Let's see how you can start to improve the dynamics in your marriage right now. It's like this: There are sixty seconds in your day that are absolutely pivotal in terms of how you and your spouse will relate to each other for the entire day and night. These sixty seconds happen in two intervals. The first interval is the thirty seconds when you and your spouse say your morning "good-byes" as both or one of you leaves the house to go to work for the day. 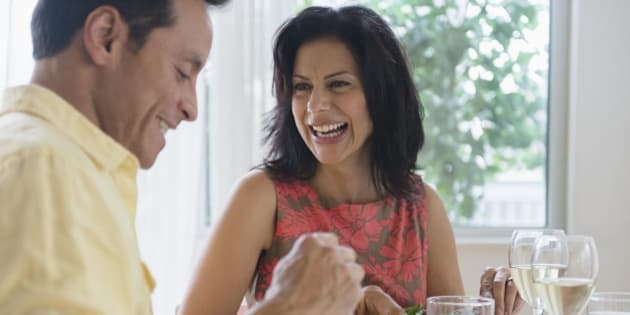 The second interval is the thirty seconds when you and your spouse say your late-afternoon or evening "hellos" as both or one of you arrives back home at the end of the day. The tone you set during these brief good-byes and hellos has a profound, lasting effect on how you and your partner will think about each other and interact with each other. For example, a wife who says good-bye to her husband as he leaves for work by giving him a flirtatious pat on the backside, telling him to have a good day and remembering to wish him luck -- whether it's for a work presentation or a dentist appointment -- will have a husband who leaves the home with a smile on his face and feeling of love in his heart. A husband who welcomes his wife home at the end of the day by meeting her at the door with a smile and a kiss, who helps her get in the door without dropping her bags or purse or files, and who remembers to ask how that work presentation or dentist appointment went will have a wife who enters the home with a smile on her face and a feeling of love in her heart. The feeling is only enhanced if spouses encourage their children to stop what they are doing (Translation: get them off the gadgets for two seconds) and also meet Mom or Dad at the door. Contrast that with what happens in many homes, where spouses leave the house without even bothering to say goodbye to each other. Spouses who come home at the end of a long, hard day to a house where no one comes to meet them at the door or even seems to notice -- or care -- that they are home. There's just no acknowledgement. Everybody's too busy with other, more important things. Like checking Facebook. Or packing a lunch. Or playing video games. Or texting a friend. Or brushing their hair. Or defrosting the chicken for supper. You get the idea. What house and spouse would you rather come home to? Those sixty seconds, that one collective magic minute of your time, can determine on a daily basis whether you and your spouse think happy, positive, loving thoughts about each other all day, or whether you have negative or apathetic thoughts about each other. That one minute of time can determine whether you and your spouse look forward to seeing each other all day or whether you dread going home. It can determine whether your evening is spent in laughter, good humor and happy companionship, or in bitterness and indifference. It can determine the quality of your interactions and the way you communicate with each other and your kids. So focus on those all-important good-byes and hellos. Part with your spouse in a loving way. Let them know you'll miss them. Welcome your spouse home with a grateful heart (and a glass of wine, if that's your thing). Let them know that you've been waiting all day to see them. We're all human -- we want to feel that someone misses us and has been thinking of us. We want to feel important, acknowledged and loved. So make your spouse feel that way. You might be pleasantly surprised by how much you can accomplish in sixty seconds. Visit DebraMacleod.com for more info.